From February 10, 2015 to February 13, 2015, Murphy Battista LLP is running our first annual clothing drive for Dress for Success in our office. In addition, donations will be raised through an inter-office bake sale. 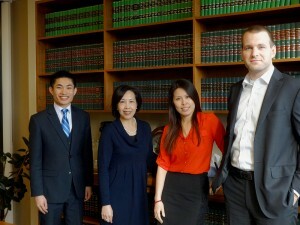 Our Dress for Success Clothing Drive Team (L to R): Brandon Souza, Cecilia Kwok, Virginia Banh and Mike Murphy. Absent: Corinn Howes. Dress for Success is global not-for-profit organization that promotes the economic independence of disadvantaged women by providing professional attire, a network of support and the career development tools to help women thrive in work and in life. Since starting operations in 1997, Dress for Success has expanded to more than 139 cities in 18 countries and has helped more than 775,000 women work towards self-sufficiency. If you have women’s professional attire that you want to part with please consider joining us in donating to a worthy cause in Dress for Success. The Vancouver boutique is under renovations from February 12 to March 12, 2015 so if you have donations during this time please contact My Sister’s Closet at 604.687.0770. 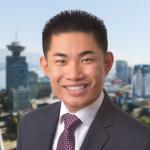 Once renovations are complete, contributions can be made to the Dress for Success Vancouver office at 685 West Hastings Street, Vancouver, British Columbia, V6B 1N9. For more details visit the Dress for Success website. The organization issues tax receipts for donations over $20. Click to donate. Don’t have business clothes you want to part with? No problem. For other ways to get involved click HERE.